So this week, I'm volunteering at Vacation Bible School at my church! Woohoo! Super-fun, but it means I have no life for the week. Luckily, I have some amazing guest posts lined up for all of you! Today's post in brought to you by one of my IRL (in real life) best friends! I'm so excited to share this with you! 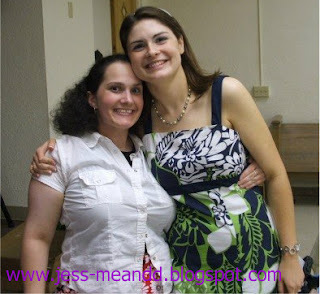 Rachel was one of my college roommates, and remains one of my closest friends. Before college, I had minimal and probably a somewhat typical exposure to diabetes. My grandparents were diabetic (what I now know was type 2). 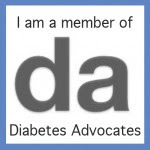 I did have a teacher who was diabetic and others who I knew who were diabetic. The summer before I went to college, I had worked at church camp with a girl who was diabetic and who gave herself insulin shots. But besides the “random” people that I knew, diabetes, was not a big part of my life. I first met Jess at college. I was one year ahead of her, and at some point in her freshman year we decided that were going to be roommates and ended up being roommates for the next two years. Prior to being roommates, and simply being friends, I knew that Jess was diabetic. I had seen her with her pump in the dining hall. When I fished around in her purse for gum, there was the small makeup bag that held the meter and test strips. There also was the tube of glucose tablets. So the whole diabetic thing was somewhat normal by the time that we moved in together. However, while I knew a number of people who were diabetic, I had never lived with anyone who was diabetic, so there was some apprehension. But, Jess being the amazing person she is, educated all of us and put the apprehension to rest. Jess showed us her pump, she showed us how it worked. She even talked to us about what it meant to be high and low and probably more importantly, how she acted when she was high or low (which after two years became a funny game, if she started acting loopy I would look at her and say “Jess check your sugar”). As a roommate, she helped us to be comfortable with this being a part of her life. I can’t even begin to tell you how many times I have seen Jess change out her set on her pump. Before she got her newest pump and after she got it filled many of our phone conversations. It was one of the first things she showed me when we had lunch after she got it. Having to live with someone who is diabetic, you have to have a great since of flexibility and patience. There were times that I remember that we were going to go hang out, and Jess would say that her pump was not working, and our plans would have to change, she would need to change out her set and make sure that her sugar regulated itself before our plans could really continue. You have to be understanding. This education of diabetes came in handy about 2 years after graduating from college when my dad who at that time as an obese man, was told that he had Type 2 diabetes. Having already lived with someone who was diabetic, who had to monitor blood sugar, it was not a scary thing. Through hard work, healthy eating, exercise, my dad has lost over 100 pounds, and is now not on any medication for diabetes and is currently able to keep it under control with diet and exercise. Through having friends and family members that daily have to deal with diabetes, I in someways have become an advocate, I try to correct misconceptions when I hear them and every year at the grocery store I buy a JDRF sneaker for a friend and many others who daily live with Type 1 diabetes. Thanks to all of you out there for helping to make your friends and family informed advocates. And Rachel, congrats to your dad for his hard work! I wish this blog had a "like" button! I'm a bit teary-eyed reading towards the end of your post. It's the same reason why I'm on the D-trail coz of my dad. I don't have diabetes though. However, I'm more inclined to be depressed.